A dark, daft and didactic little dramedy that insists on steering its high-concept directly down the middle of the road, The Beaver tells the winsome tale of a miserable and withdrawn middle-aged family man who finds a hand-puppet in the dumpster and begins to live his life with this stuffed animal as his permanent intermediary. 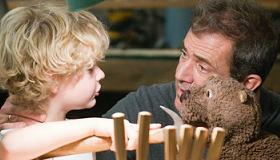 A narrow and cleanly shot production that transcends its modest scale with star power (and all the advantages such clout brings), The Beaver will be wisely marketed as a niche film by Summit Entertainment, but it should nevertheless command attention disproportionate to its box office despite embattled star Mel Gibson's winsome and fitting return to the screen. Gibson is Walter Black, the married CEO of a toy company that—much like its leader—is on the brink of disaster. The Beaver may only devote a handful of scenes to Walter at work, but for all intents and purposes the man is effectively just a Disney Dad with a suicidal streak, forsaking his family to devote more time not to his work but rather to his depression. Walter's craggy face is withered and drooping, his refreshingly vague mental illness fracturing his family in every which way. His wife Meredith (director Jodie Foster), designs roller coasters as she waits for the next shoe to drop, while Walter's teenage son (Anton Yelchin) irritatedly records all the commonalities he shares with his father. Last in the Black clan is young Henry (Riley Thomas Stewart), who exists only to look cute and ease Walter's transition back into his house once he's immovably affixed a hand-puppet to the end of his left arm. Walter finds the titular beaver in the trash after Meredith kicks him out of the house, but it's not until a failed suicide attempt ends with a head trauma that Walter begins speaking to (and through) the stuffed animal. By entertaining the idea that the talking woodland creature is a symptom of Walter's head injury, rather than a treatment for a mental affliction, the film allows the audience to share in the Black family's wary skepticism. Walter is immediately revitalized by the beaver—who Gibson voices with a Cockney accident that's somewhere between Ray Winstone and a high school production of Oliver—and the film wrings a parade of wry smiles from the unlikely duo as they erase Walter's withdrawn persona with a slapstick act that errs closer to Sesame Street than suicide. Jodie Foster is behind the camera for the first time since she helmed Home for the Holidays back in 1995, and her absence from the director's chair may have left her feeling too rusty to shoot for the moon—she's so devoted to communicating the film's message that her simple, unaffected visual approach only serves to underscore the facile banalities of Killen's script. Nevertheless, Foster displays a keen eye for mordantly quick-witted sight gags (watching Mel Gibson gamely pretend to make a hand-puppet poop never really gets old), and the venerated actress naturally inspires warm and full-bodied performances from the bulk of her cast. Gibson—who for all of his decidedly unpleasant personal troubles has always been a spirited comedian—dives into his role hand-first, intuitively jiving with that mangy puppet as if it had been a part of him since birth (it's a shame he didn't wear it in The Patriot). It's unlikely that Gibson will ever again enjoy the career goodwill he did before he revealed himself to be the worst human currently living, but Walter Black provides him a spookily fitting comeback. Gibson's presence is initially uncomfortable, but as soon as he hires the beaver as his spokes-puppet Walter dissolves into a proxy in much the same way that Gibson dissolves into Walter, creating a ladder of masks and fronts that work like Russian dolls to allow all parties an agreeable distance from themselves. Ultimately, that's the territory this furry riff on Life As a House is most eager to explore: how the inertia of modern living sometimes needs to be interrupted by any means necessary. It's a fascinating inquiry, and one The Beaver supports by maintaining its respect for Walter—the film makes no concessions in exploding notions of self-help, and commits to the validity of his unusual recovery method until the bitter end. Unfortunately, The Beaver is unable to manage the uneasy balance between its tender pop psychology and its irksome compulsion to contort its premise into all of the most reductively familiar shapes. Things flounder whenever Gibson is off screen—a prolonged subplot involving Yelchin romancing a classmate of his (a stilted Jennifer Lawrence) is bracingly inept—and Foster too hurriedly juggles too many tones to ever have a good handle on any one of them. An awkward stew between American Beauty and Harvey that only touches a nerve at the eleventh hour, The Beaver is ironically salvaged by GIbson's complete performance, and the film's commitment to his character ensures that it will endure beyond the controversy, resonating in spite of itself. Cast: Mel Gibson, Jodie Foster, Jennifer Lawrence, Anton Yelchin. Rating: PG-13 for mature thematic material, some disturbing content, sexuality and language including a drug reference.